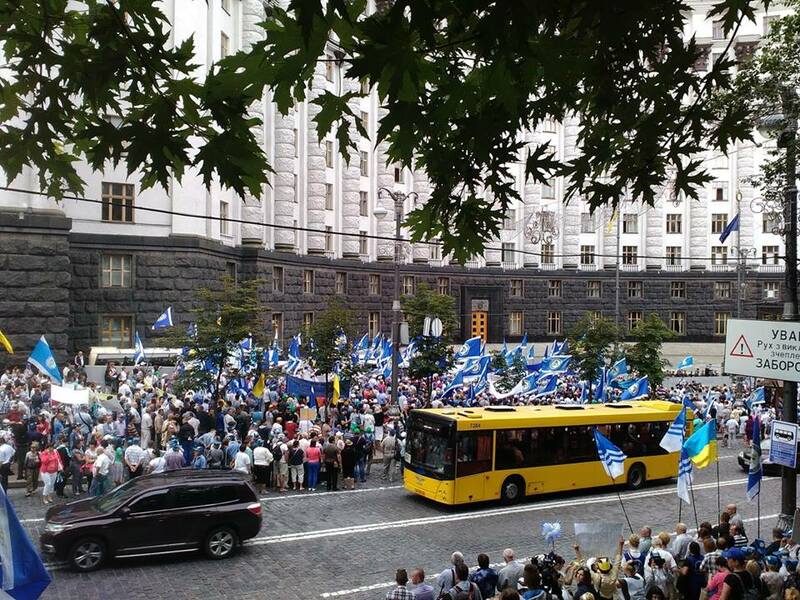 The Ukrainian trade unions have held a major protest in Kyiv today (6th July) against austerity. We received the following report from ‘Labour Initiative’ and also the Federation of Trade Unions of Ukraine. The march was held to highlight austerity measures that disproportionately hurt low and middle-income families. Following International Monetary Fund demands Ukraine has drastically increased the cost of home heating gas and electric utilities. The IMF program and government actions align to shift the past and current costs of massive high-level corruption on to working people. This dynamic is undercutting support for the government and jeopardising the whole ‘democratic moment’ for the country. On 6 July over 50 thousand trade union members and workers from all over Ukraine gathered in Kyiv for the All-Ukrainian Protest March, picketing and rallies near the Parliament and Government of Ukraine protesting against the shock increases in gas price and communal tariffs under the slogan «EUROPEAN PRICES – EUROPEAN WAGES!». They responded to the call launched at the meeting of the FPU Council on 23 June. The Council elaborated joint trade union position concerning shock increases in gas price and communal tariffs, and adopted a plan of actions to protect workers. Trade unions stressed that the question is not only about reducing prices and tariffs but first of all about increasing wages and social standards. One of the possible options to mitigate consequences of the price shock is to increase income of the population by raising minimum wage and minimum pension in two times to bring them in line with the living wage. Trade unions also proposed another option – to raise wages and simultaneously reduce gas price. Marchers protested against shock increases in gas prices for the population, tariffs for hot water and heating, expected increases in tariffs for electricity and cold water, against the state policy of shock therapy, austerity measures at the expense of workers and demanded radical increases in wages and pensions. Addressing the protesters FPU President Grygoriy Osoviy stressed that the Government should listen to the workers’ voice and address the issue of tariffs and wages. “We will make the Government and the Parliament address the tariff issue. Today we will hand our demands and proposals to the Prime-Minister and MPs. MPs should not go on holidays until they solve this issue. We are ready to block the Parliament. Workers’ wages should reflect the actual living wage. It means that minimum wage should be at least UAH 3000 and the average wage should be UAH 8-10 thousand”. Participants in the All-Ukrainian Protest March passed the Resolution (see attached). – from Parliament members – to immediately hear the report of the Government on its price policy and social protection measures; to pass decisions to prevent reduction of living standards of the population. Boxes with trade union demands signed by people from all regions of Ukraine were handed to the Parliament and Government of Ukraine. As of today 2 million 345 thousand signatures have been collected. Later in the day the trade union delegation headed by FPU President Grygoriy Osoviy met with the Prime-Minister and passed him trade union demands and proposals. We, participants in the All-Ukrainian action, representing trade union organisations and labour collectives, on behalf of 8 million workers, labour veterans, students strongly protest the shock increase in gas and electricity prices that has lead to the double increase in communal tariffs for the population and will take most families to the brink of survival. For the last two years prices for goods and services increased in several times, the inflation exceeded 180%, while the minimum wage guaranteed by state increased only by 19%, and the purchasing power of workers’ wages, pensions on the contrary reduced by more than one third. Owners of enterprises pretend that it was not they who put half of the economy in the shadow, hide one third of wages from taxes and social contributions, reduce workers’ wages to the level of alms and make the Pension Fund in fact bankrupt. Having received savings on social contribution of UAH 80 billion due to the reduction of the level of social; contribution to 22%, they have done nothing to formalise shadow wages of millions of illegal and deprived workers. To protect people from the price shock the Government proposes to apply for subsidies that are funded from taxes, i.e. from our wages. Surely, such a type of state support is appropriate for pensioners, disabled, unemployed, large families, but by no means for working people. Without adequate increase in wages, the vast majority of workers will apply for the subsidies. This is a big step backwards for the country that took a path of reforms and European integration. Hardworking Ukrainians have the right to live on decent wage for their labour, not on donations. We confirm that the policy of subsidies does not find support among workers, creates dependency mood in the society, lead to concealment of income, informal labour relations. This choice requires further increase in public spending on subsidies and thereby increases the tax burden on legal economy and workers. Therefore, the trade unions, whose main task and responsibility is the social protection, could not silently watch the violation of workers right to earn enough to live decently guaranteed by the Constitution. We strongly protest shock increases in prices and tariffs not backed by relevant increases in wages. People cannot and do not want to work for gratis. We demand from the Parliament and Government of Ukraine to prevent social levelling in the country. We join our forces to express our common position, bring it to the attention of the Ukrainian society and call authorities to immediately react to the situation. to hold consultation with trade unions and start to increase the share of wages in cost of goods and services to the European level of at least 25-30%. to pass relevant decisions to prevent reduction of living standards of the population. WE STATE that if our demands are ignored the trade unions will resort to more hard actions including strikes as provided by Article 44 of the Constitution of Ukraine. Previous Why is the war in eastern Ukraine still going on?